As the young guard opened his mouth to answer, he and Tammy saw another guard glaring at them. They watched as the guard slashed with his fingers across his throat, silently ordering the young guy to keep quiet. The gesture was a threat and the young man knew it. He held his tongue. Tammy’s husband Jerry Brewer, who has been fighting the Bakken Pipeline for three years, has his own stories of threats. A local community college where Jerry teaches has warned him “not to get in trouble.” Jerry helps to organize protests, but avoids arrest. Even so, his insurance agent has suggested that Jerry’s property rates will go up unless he stops his work against the pipeline. Jerry keeps going anyway. The Bakken Pipeline already has a green light from the Army Corps of Engineers and the Iowa Utility Board — in spite of full-throated protests by Iowans. 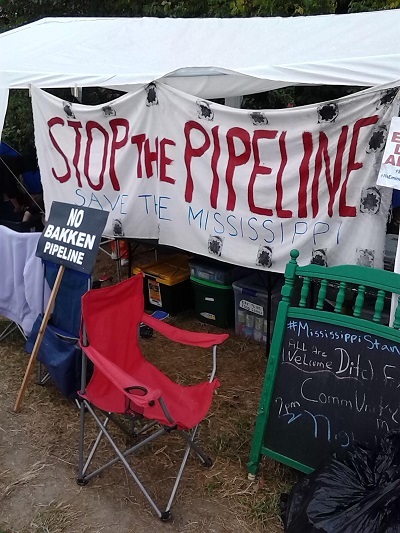 Now groups like Mississippi Stand and the Iowa Pipeline Abatement Group are adopting strategies used by Standing Rock protesters in North Dakota — putting their bodies in the way of pipeline construction. In North Dakota, the Standing Rock encampment numbers over 7,000. In Iowa, three encampments are growing larger every day. At the Mississippi Stand just south of Montrose IA, a man wearing an IBEW Local 13 t-shirt stops to explain how he saw Jessica Rezinek on a Facebook post and decided he had to help her. He tells me his union’s mission is to fight for what’s right and fight for people. He spoke proudly of being a union man since the age of 20, and how his father was the union president of another union in a neighboring community. On October 1, 2016, over 30 protesters were arrested at Mississippi Stand. Across the Mississippi River, Illinois coalitions are also fighting to halt new pipeline construction. Enbridge owns 27.6% of the Bakken Pipeline project, which is only one new project threatening to come across the river. In northern Illinois, Enbridge has already built a new stretch of pipe from the central Illinois Flanagan Terminal, south to the southern Illinois Pakota Terminal where the company hopes it will arrive. And in Wisconsin and five northern Illinois counties, Enbridge is gearing up to build a “twin” line to one already in the ground running from Duluth MN, through Wisconsin and northern Illinois until it reaches Flanagan. At this time, Enbridge is denying to those in northern Illinois that it plans to build the “twin” to Line 61, but a Bloomberg News aticle that ran in Canada announced the new line weeks ago. In Wisconsin, where Madison news sources are reporting the same story, landowners are already fighting the eminent domain cases Enbridge has brought against them — demanding that construction easements be increased from 70 to 300 feet across, to accommodate one or more new lines. Enbridge does not yet have ICC approval for a new Illinois line. Dave and Sandra Davis, organizers for Save Our Illinois Land (SOIL) hope to “get out in front of this issue and stop the project before it secures state approval.” They have held DeKalb, Illinois community information sessions in packed rooms. Citizen requests are coming in for meetings in the other four counties that could be affected. Like the Iowa activists, SOIL is building coalitions with other environmental groups, labor and social justice organizations. The coalitions are growing stronger as it becomes more and more difficult to discount the collision of climate change, extreme weather and oil pipelines accidents. When it comes to pipeline spills, Enbridge’s name is well known. In 1979 Enbridge was responsible for an oil spill in Bemidji, MN. Thirty years later Enbridge still pays for the one-of-a-kind research facility established at the accident’s site to study how the oil plume is affecting the area’s underground water aquifer. The corporation was responsible for the huge and costly Kalamazoo oil spill in 2010. It took years and over one billion to clean up the mess, the EPA levied a fine of $61 million against Enbridge as part of an overall settlement of $177 million but the area is still not completely restored. In September 2010 Enbridge closed Line 6A for eight days after it leaked 6,100 barrels of crude near Romeoville, Illinois, affecting ground water, a retention pond and a wastewater treatment plant. The EPA fined Enbridge over $100 million for this accident. Current federal guidelines require pipelines under rivers to be buried three to eight feet below the river bottom. With extreme weather trends, those requirements may not be adequate. To get a sense of how the Army Corps of Engineers has been attempting to control the Mississippi, read “What We’ve Done to the Mississippi River: An Explainer” by Alexis C. Madrigal in The Atlantic. That oil companies believe they can safely run pipe under a river that changes as much and as often as the Mississippi will seem reckless indeed in light of the river’s history. In northern Illinois, the “twin” to Enbridge’s Line 61 will run under several creeks and rivers. It will also sit on top of two Illinois aquifers. An oil spill in that area would not only destroy some of the most fertile farmland in the nation, but also contaminate aquifers and require decades of study and remediation. When standing with protesters at Standing Rock, think of Iowa and Illinois as well. All these pipelines, before they send oil to storage tanks in Cushing Oklahoma or storage and refineries in Louisiana, converge in Illinois. Coalitions gathering to stop pipelines in Illinois are part of efforts to kill the black snake, too. If you want to donate or find out how to get involved in Iowa: email frank.cordaro@gmail.com. To help SOIL in Illinois, message them on Facebook. Sandra Lindberg is an activist in Bloomington, Illinois. She is a member of Solidarity’s Ecosocialism Working Group and a member of System Change Not Climate Change. 1Federal Register Vol. 81, No. 68, 4.8.16. Proposed Rules p. 20728.